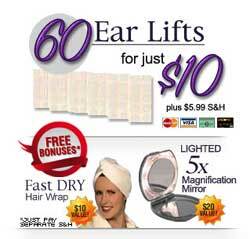 Transform Your Ear Lobes Instantly! Ear Lifts are the invisible support solution that transforms your ear lobes from droopy and saggy to lifted and taut. Wear the earrings you love everyday! With the support of Ear Lifts, you can wear your favorite earrings everyday. Big or small, heavy or light, now you can wear your earrings with confidence. You can also use Ear Lifts as a preventative to help support and maintain the youthful shape of your ear lobes so they don’t stretch or deform over time.